Gal Yifrach and Art Papazyan discuss their big $90K cash game hand from @LIVEattheBike. Art Papazyan made a big bluff, and Gal Yifrach made a big call. Both discuss the @LIVEattheBike hand. Here's a fascinating hand from a recent "High Stakes Fridays" edition of Like at the Bike!, one involving a impressive river call by Gal Yifrach of a big river bluff by Art Papazyan. 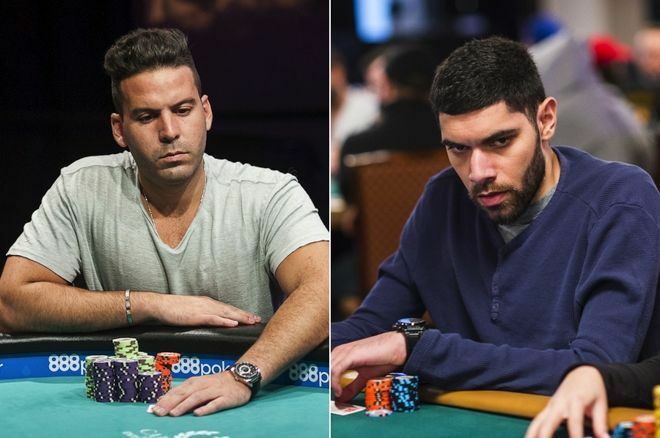 Besides being accomplished cash game players, both Yifrach and Papazyan have enjoyed considerable tournament success as well. Yifrach has nearly $1 million in tournament winnings, highlighted by a World Series of Poker bracelet win this summer in Event #28: $3,000 No-Limit Hold'em. Papayzan, meanwhile, has just over $1.1 million in cashes, including earning two World Poker Tour Main Event titles in the space of just a few weeks last year at the WPT Legends of Poker and then again at WPT Maryland Live!. Here's a rundown of the action in the no-limit hold'em cash game featuring $50/$100 blinds with a $100 BB ante. You can also watch the hand play out in the video below. After that, read some analysis of the hand from both Papazyan and Yifrach. Following a early position raise to $300 and a call from the hijack, Yifrach called as well from the button holding , then both blinds called, too, including Papazyan in the small blind with . With five players in, the flop came and it checked all of the way around to Yifrach who with middle pair bet $1,000 into the $1,600 pot. With two overcards and the nut flush draw, Papazyan chose to check-raise to $3,700, clearing all the players in between the two. Yifrach thought a short while and called, pushing the pot up to $9,000. The turn was the , and Papazyan bet $6,800. Commentator Bart Hanson suggested Papazyan could only really be representing sets given the unlikelihood of a two-pair hand, surmising that if Yifrach thought Papazyan was in fact on a draw he could continue. That's what Yifrach did, calling the bet. Pot $22,600. The river was , missing Papazyan's draw and overcards. With $33,500 behind, Papayzan took some time before betting all in. Gal had nearly that left himself — $30,500 — and thought for a while before making the huge call and winning the almost $90K pot. "I think my flop and turn play is standard," said Papayzan afterwards while sharing his thoughts on the hand with PokerNews. "I think the river can go between checking and betting. Checking is better against most players, but Gal plays so many hands preflop which means he's going to end up at the river with many weak one-pair hands that have to fold to a bet, or at least they should." While many of us watching might interpret Papazyan's big river bet as him continuing to represent a strong hand like a set (such as Hanson surmised earlier in the hand), he explains how the bet in fact had more to do with his perception of Yifrach's weakness. "When you overbet rivers, it's more to do with what your opponent's range is than what you're 'representing,'" explains Papazyan. "I thought his range was weak and I thought he'd fold. In fewer words, I got owned." Yifrach also shared his analysis with us, starting with his preflop call with four-trey offsuit. "First of all, normally I won't be in the hand if it weren't for my having position," Yifrach notes. "Secondly, I got good pot odds to be in a multi-way pot with not a very good hand that might outflop some other good hands that I knew were calling preflop." Knowing he would need "to flop big" to go much further, Yifrach decided to take a stab at the pot with his marginal hand once it checked around to him on the flop. "I bet when I'm last to act thinking no one really flopped big trying to take it down on the flop," he explains. "Then comes Art with the check-raise." "Now my first thought was to fold, but then the sizing didn't feel right to me, so I decided to call with position and take a turn card to see what he would do next," says Yifrach, adding "I was blocking some of possible hands he might have." Papazyan's big bet sizing factored into Yifrach's turn decision as well. "When he bet the turn which was also on the bigger size, I had to think what he could possibly do it with. Yes, he could have hit the 10 on the turn, but I don't think he would bet that amount." Keeping in mind that Papazyan had in the past "played a little tricky" versus Yifrach when having a hand, Yifrach nonetheless chose to continue with a call. "Once I decided to call the turn, I knew if the river paired the board or bricked for any straight or flush draw combo, then it wouldn't make any sense for me to fold [to a river bet]," says Yifrach. "So when the river came and he went all in, I had to reconstruct how the hand played out and figure out if he was actually going for it with complete air or he actually had a monster." As Hanson noted on the commentary, Papayzan's overbet on the river could be interpreted as having polarized his possible hands in such a way. "I don't think he would go for the overbet [of the] pot trying to get paid after hitting a jack on the river," estimates Yifrach. "Sure, he could have had and maybe would have went for the same move, but that would be very unlikely and unfortunate for me and I would actually look stupid." Yifrach says the use of the action clock added some extra pressure as he thought through what to do, but ultimately he was able to run through all of the possibilities in time to make his river decision. Having had some history with Papazyan mattered as well ("I cannot say I would have made that call vs. every player," says Yifrach). "Some of the hands he could have done it with would be a pair and a flush draw, but I beat bottom pair and a draw, and I [also] beat all combos, so it would only make sense to call at the end. The amount [of Papayzan's river bet] didn't matter — those are just betting units. I didn't really think 'oh, it's 30K he's putting out there.' It's just poker in the end, and I give him props for going for it." Pamela Maldonado contributed to this article.